This is my mum's recipe and has been a favourite since I was a kid. This dish does not look very pretty but it is very tasty comfort food. The braising method is similar to hong shao pork. 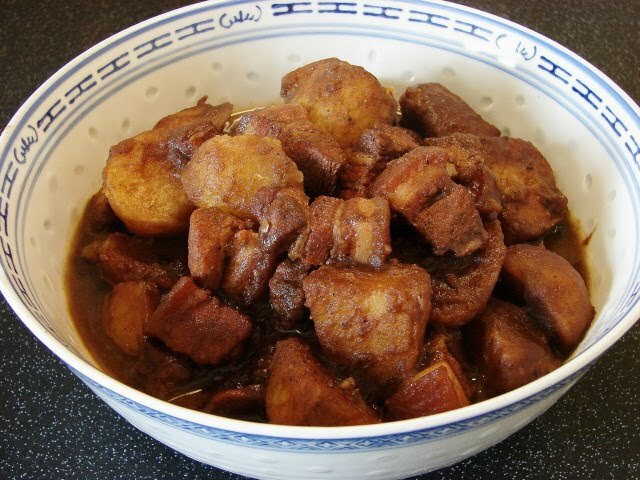 The meat is succulent and potato chunks are soft and absorbed all the meat and sauce flavour. I can eat this every week and still don't get tired of it. The secret to make the potato very tasty is to deep fry in oil first. This makes the potato tastes sweeter and nuttier. If you hate deep frying you can add raw potato to the stew but the potato won't be as tasty. Heat the oil in wok till hot. Fry the potato for about 10 minutes till lightly brown. Remove potatoes and drain on a large sieve or spider skimmer. Remove oil from wok. You can also fry the potato in a deep fryer. Heat about 1 tbsp of oil in the wok and fry the garlic and ginger. Then add in the red fermented beancurd, juice, star anise and five spice. Stir till fragrant then add the pork, stir fry for couple of minutes then add wine, light soy, dark soy and sugar. Add in about 1 cup of water or enough just to cover the meat. Let the liquid come to the boil, lower heat cover with lid and simmer for about 30 minutes or till the pork is tender. Add in the fried potato chunks. Then add in about 1.25 - 1.5 cup of boiling water (just about covering the potato and meat), let this boil for few minutes, lower the heat and simmer till the potato has absorbed about 1/2 the liquid and the skin on the potato beginning to break and thickening the sauce. Heat off and sprinkle on some ground pepper. Do not let the sauce dry too much, the potato will continue to absorb the sauce after cooking. If you don't fry the potato, add raw potato to the pork after the meat has been cooking for around 20 minutes and add in enough water to cover the potato and meat and stew till meat and potato are tender. I like the potato on the soft side, if you like it firm use less water and just cook till tender without the skin starting to break. If you don't like belly pork, you can sub with spare ribs equally very tasty but you need more as there isn't much meat on the ribs. Increase the quantity to about 450 - 500g. My mum made this all the time... but I can't recall the red fermented bean curd flavour. This sounds absolutely yummy with steamed rice or even sticky rice. Fermented bean curd adds that extra flavour that is so yummy than just soy sauce.